Undergrads Surpass World Leaders in Crafting Global Environmental Agreement | SPA News | School of Public Affairs | American University in Washington, D.C. Most students just want to get a good grade. 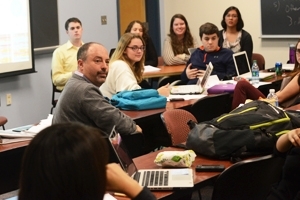 Students in Prof. Todd Eisenstadt’s Comparative Environmental Politics class want more. These savvy undergraduates aim to craft a successful global treaty. “The climate talks in Qatar may have stalled,” said Eisenstadt, “but I knew my class could do better” in their attempts to craft a successor agreement to the Kyoto Protocol, the international treaty that set binding targets for the industrialized countries to reduce their emissions of greenhouse gases. A total of 191 nations have signed and ratified the protocol. The only remaining signatory not to have ratified the agreement is the United States. Each of the 25 students in Eisenstadt’s class selected a country to study for several weeks and then represent in a two-part series of simulated talks. In the first session, the students negotiated in blocks to reach agreement on text in three important articles; the second class was more "philosophical," establishing a pre-amble to the new treaty. The class introduced students to the complex matrix of factors every nation must consider in crafting its environmental policy, from the difficult trade-offs between short- and long-term benefits to a country’s self-interests versus the interests of the planet. The simulation also gave students hands-on training in negotiations, policy writing, political strategy, and other key skills. Though Eisenstadt was prepared to use the carrot (pizza for reaching an agreement) and the stick (inventing natural disasters to befall the world’s top emitters U.S. and China to spur them to agree), the students showed up our world’s leaders by reaching a prompt and amicable, albeit “suboptimal,” agreement without resorting to such tactics. “The agreement reached by my students fell short of the emissions cuts needed to keep the heat from going up less than the 3.6 degrees Fahrenheit, the fatalistic but practical goal stated by the UN negotiators in Copenhagen 2009,” said Eisenstadt. Dan Hubbell, a senior political science major, was disappointed that the final proposal was “painfully watered down,” but ultimately satisfied with what he gained from the experience. “The simulation took a semester’s worth of work and time to orchestrate, but it was worth every second of it. I found a great deal of satisfaction in watching the deal take shape and crafting something approaching a solution,” said Hubbell, who served as a delegate representing Switzerland.